Harry James Lincoln was the only son of Frederick and Ethyl Lincoln of Old Chesterton, Cambridge. 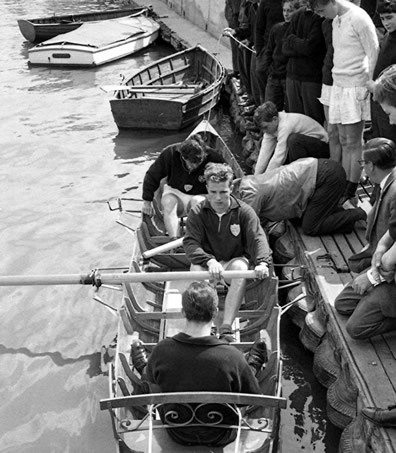 From an early age he pottered about in boats with his father, a keen motor boat enthusiast, and after leaving St John’s College Choir School in Cambridge he joined the prestigious HC Banham boatyard as an apprentice. Here he learned every aspect of traditional boat building, ship-chandlery and watermanship. From this beginning he was to become one of the most knowledgeable and experienced authorities on boats, boating and navigation on the Fenland Waterways. He was a very active member of the old Fenlands branch of the Inland Waterways Association founded in 1949 and served as its chairman. Soon after he retired from that office in 1957, the Fenlands IWA branch was disbanded leading indirectly to the formation of the Great Ouse Boating Association (GOBA) and the East Anglian Waterways Association (EAWA), two organisations still flourishing today. He was also a founder member, in the early 1960s, of the Great Ouse Boatbuilders and Operators’ Association (GOBOA), now known as Cambridgeshire Marine Industries, representing local boat hire and trade interests. Harry also supported the Great Ouse Restoration Society in its heroic battle to reopen the navigation from Tempsford to Bedford. He represented the interests of river users on various committees of the Anglian Water Authority and district councils in the area and served nationally on the Eastern Region of the Sports Council. Harry was president of the Ship and Boatbuilders’ National Federation (now British Marine Industries) and as a chartered marine surveyor and Associate Member of the Royal Institute of Naval Architects he influenced the British and International safety standards in small boat construction. 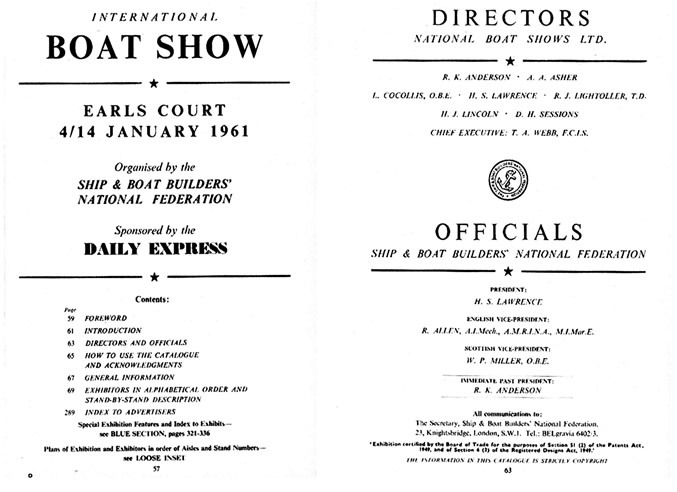 He was a co-founder of the International Boat Show and as chairman of National Boat Shows Ltd. helped to establish the annual Earls Court show as a major event in the boating calendar. Below is an extract from the 1961 catalogue showing Harry as a director. He produced and published a map of the Fenland Waterways, an invaluable guide to anyone venturing forth on them in those days when leisure cruising was in its infancy. He is also remembered for Lincoln Bridge which is built over the River Great Ouse at Ely connecting the city with the marina. In summer his spare time was usually spent cruising on the river and in winter one of his favourite pastimes was fen skating. For many years he was on the committee of the Fen Centre of the National Skating Association and helped run the Speed Skating Championships. He was also a beautiful ballroom dancer. It seems that Brouhaha was probably owned briefly by a Mr Asplin about whom we know almost nothing. She is first remembered when Harry kept her moored at the bottom of his garden in Godmanchester. He was a familiar site at her wheel cruising the Fen Waterways, yachting cap slightly askew, smoking his favourite pipe with a whisky at his elbow. Following the death of Harry Lincoln our boat (which then became Orchard Delight) was owned by Alan Scarrow, who, as an apprentice, had been one of the original team that built her. We are indebted to him for providing us with copies of the photographs of the various stages of her construction in 1960. 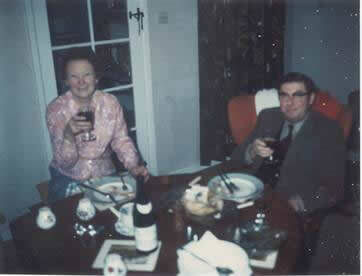 She was next owned by the late Alec Goodge and his wife Betty of Harlington, Bedfordshire. They had owned a GRP cruiser for about a year when, in November 1999, they went to Jones’s Marina in St Ives, as Betty says, ‘Just for a coffee.’ There they saw Orchard Delight and Alec fell in love with her. There followed a deal with Alan Scarrow and the boats were swapped. We are grateful to Betty who has provided us with a wealth of photographs and shared her memories of the happy times they had with Orchard Delight.